Welcome to Beacon 2.0! While there are similarities with the 1.0 version of Beacon in terms of functionality, the all new Beacon 2.0 is way easier to work with and gives you many more options to make serving your customers a breeze. Check out this article to get a summary of the differences between the versions. 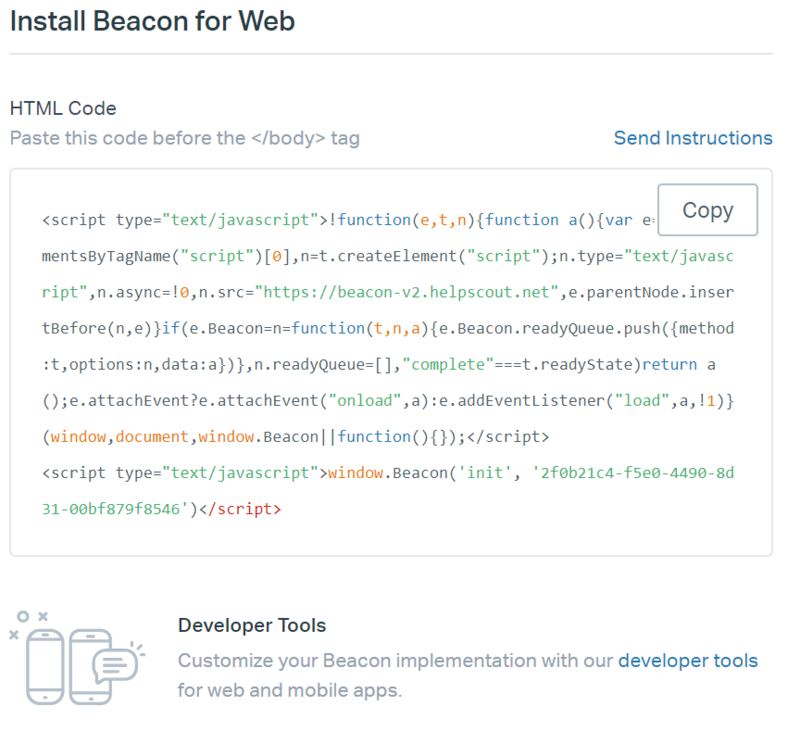 Follow these 5 quick and easy steps to create your first Beacon! Use the all new visual Beacon Builder to design an embeddable that matches the look and feel of your website. You can use modes to determine the customer experience swiftly, and even customize the prompts to capture your own je ne sais quoi. Check out How to Create a New Beacon. Your customer just needs a quick answer and is happy to find it themselves? There’s no need to chat from the Beacon on your returns page, but you’re happy to chat on the pricing page? Suggest just a few relevant articles tailored to your page URL and you’ll be amazed how many customers may just go ahead and help themselves. Read more about Suggested Content in Manage Docs Settings. Where you want to encourage self-service the most, embed a Beacon with Self-Service mode enabled. Customers will see your help articles first, and can only contact you once they've interacted with your help content. If you’ve already got a Help Scout Docs site, great! Pick and choose what to show. If not, check out the basics on how to create one. Let your customers start a chat with you when they need immediate assistance from your team. When talking to a customer is most important, the Ask First mode will fit the bill perfectly. It prompts Beacon to open directly in the Ask tab, and customers see your contact options before anything else. Don’t worry, though. Help Scout makes sure customers can only see the chat option when there’s somebody available on your team to meet their high chat expectations. Follow these steps to set up chat for one of your Beacons. Each team member can set the maximum number of chats they feel they can effectively manage at a time. Coach team members to keep their chat availability up to date. Nobody available to chat at the moment? Perhaps a customer would prefer to communicate with you asynchronously, or your team just isn’t ready for chat. No problem. Beacon still supports good ol’ email messaging in every Beacon mode. Check out the options here. Use the Advanced Security features to show customers their full support history in the Beacon. Pre-fill the Beacon message form fields with known values — like their name an email address — to save your customers some keystrokes. Do you have customer details in your homegrown apps that would be helpful to see as you are answering chats or messages? You can use the Beacon Identify method to gather other known information about your signed-in customer and display it in the chat and conversation sidebars. 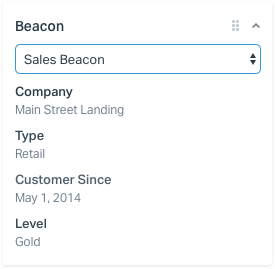 With a quick glance to the Beacon sidebar app, your team can see key customer data -- like outstanding orders, course enrollment, contracted services, or planned events -- without having to tab out to perform a separate information lookup. Bonus: It’s easier than developing a dynamic custom app. 5. Train up that team! Check out the Chat overview video and helpful articles, then share them with your team! Using the Chat Options Menu to insert articles, add notes, and end chats.